This morning, I woke up to a tweet (that says a tweet, not a twit, though I have called my husband worse…) from the lovely Louise who blogs over at wonderful Little Hearts, Big Love. 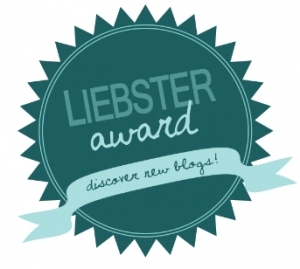 Louise has nominated me for this blogging award because she is super brilliant, really thoughtful and kind and, for some reason, she finds my blog amusing. Who knew?! In all seriousness, Louise is such a supportive blogger. I am still fairly new to this blogging game and she has shared, commented, liked and made me feel so welcome in the blogging community so, for those reasons Louise, thank you very much. Louise is a married Mummy to 2 lovely little girls, one of whom was born with CHD, or a Childhood Heart Defect, which you can read more about here. She has been ever so poorly, and still has a long and unkown road ahead of her with looming operations and medical intervention, but Louise shares her families experiences to raise awareness of CHD and to support others going through a similar situation. She works bloody hard and, in my eyes, is a bit of a super mum (even though I know she would disagree with that statement). So, thanks again Louise and now for the answers to my questions she has set. Here goes! I began blogging because my friends and family were fed up with me littering my personal facebook page with long rants and rambles about the kids and holidays so I started to write my blog, Life is Knutts. In all honesty, it was due to friends and family that I began my blog. It began when I wrote about the saga that was our Honeymoon to Iceland in 2012 on facebook. People found my posts funny and told me I had a knack for writing so I bit the bullet, found some courage, and started Life is Knutts a few years later. I do love to write and I also love to make people laugh. With me, at me, whatever. As long as people have a smile on their face after having a read of my posts, I consider it a job well done. 2) Which of your own blog posts is your favourite? If I had to pick one, it would be this one, To Tantrum or not to Tantrum. I am not normally an opinionated person, but something happened in the media (and on my personal social media) which really got my back up. I couldn’t help but have a little rant about it! 3) Marmite – love or loathe? LOVE!! In fact, I had it on my crumpets this morning. Sorry Marmite haters! Gone Girl. I don’t get to read many books due to blogging and family life, but that was the last one I read and it was utterly brilliant. It kept me gripped and I couldn’t put it down. I think the book was better than the film, but that was also pretty good if you fancy a good movie to watch. I also love the Harry Potter books. They’re brillaint escapism. 5) If you could only go back to one of the places you have visited on holiday, where would you go and why? Iceland. It is one of the most magical places I have ever been to. It’s otherworldly, mysterious, rugged. Like nowhere else I have ever seen. The people there are also the friendlist I have ever met and the landscape…utterly breathtaking. I also have a passion for Scotland, much for the same reasons. If I was brave enough to make the move there, I would. It’s just stunning and we are so lucky it’s on our doorstep. 6) What’s your favourite childhood memory? Family holidays to Cornwall and Devon. Specifically, cycling along the Camel Trail between Wadebridge and Padstow with the wind in my hair, the sea breeze in my face and a Cornish Pasty or a Cream Tea at the end of it. I think the memories and experiences during these childhood holidays set me up for life. I am a real lover of the outdoors, especially the coast. I just love being there. It’s where I ‘find my happy’ I think. 7) What’s your top blogging tip? Join Linkies. You get to know who is who, you get to connect with other like-minded people, and you can get your work ‘out there’ whilst networking a bit at the same time. Also, ignore stats. It’s really easy to get caught up in page views and likes, but at the end of the day, if you enjoy what you’re doing and get happiness from it, that’s all that matters. It takes time to build these things up, but the rewards will come. Just keep plugging away. 8) If someone made a film about your life, who would you like to play you? Pahahaha!!!! What a brilliant question! 9) Is the glass half full or half empty? Half full. Unless it’s got Gin in, then it’s full to the brim. Always. 10) What’s your top tip for getting organised? iPhone Calendar alerts! I live by the things. They’re constantly pinging up on my phone and I always set them to go off twice. The first time they will go off a day or two before I need to do anything about them as a reminder and then again an hour or so before the event so I can make sure I’ve not forgotten. I also still write stuff on my hand! It’s one of the only ways I manage to remember stuff sometimes! Haha!!!! How long can I blame baby brain for I wonder? So, there we have my answers to Louise’s questions. I hope the answers were enjoyable to read! I nominate the following bloggers to play along if they wish. If you do take on the challenge, you just need to write a blog post with a mention of my blog in it, answer the questions I set and then mention some other bloggers who you nominate for the challenge! Simples! If you could learn any skill, what would it be and why? What do you enjoy the least with regards to blogging? Thanks again Louise, and thanks for reading my fellow Knutters. You’re all brill! A well deserved award. I love reading your blog. But I’ve never heard of Linkies, please explain! GeorgieMoon recently posted…Jazz festival in Greece…..
Linkies, or link ups, are run by bloggers. I’ve not started one myself yet but I join in on others. Basically, you find a link up you like, you’ll be able to join in on a lot, and you see what day of the week it opens. They all open different days and run for different lengths of time. You add a badge from the bloggers linky to the post you’re linking up/sharing and then you copy and paste the link to your post to their linkup. It’ll be explained on their link up page.